Does your resume lack substance? View this resume sample for an entry-level chemist to see how you can formulate a resume to help launch your career. To be a successful candidate for chemist jobs, resume expert Kim Isaacs says it helps to have a comprehensive resume. Does your resume lack substance? 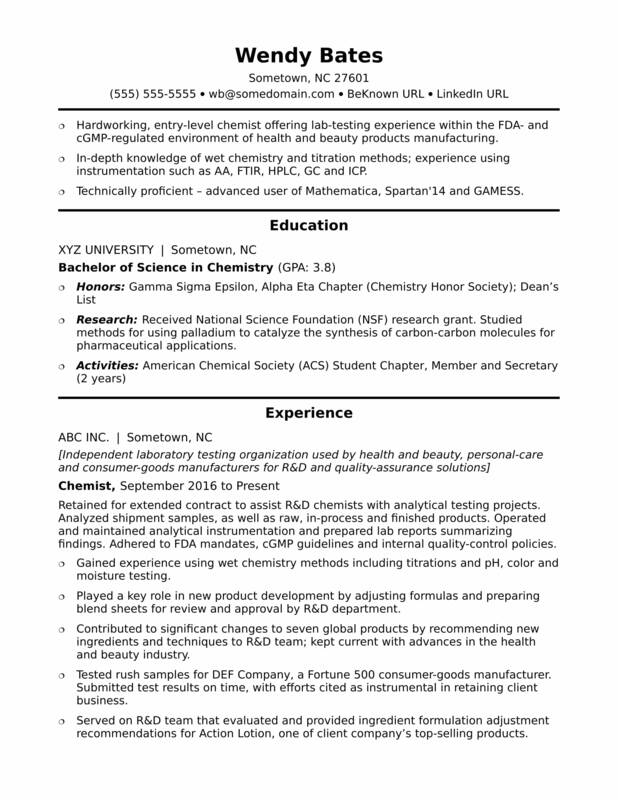 To see how you can formulate a resume to help launch your career, view this sample resume for an entry-level chemist Isaacs created below, or download the entry-level chemist resume template in Word. And if you need more help, get a free resume evaluation today from the experts at Monster's Resume Writing Service. Jobs for chemists are projected to grow by 7% (or 6,300 jobs) from 2016 through 2026, according to the Bureau of Labor Statistics (BLS). You'll find the highest level of employment for this job in the following states: California, New Jersey, Texas, Pennsylvania, and North Carolina; and in the following metropolitan areas: New York City; Newark, NJ; Houston; Montgomery County, PA; and Los Angeles. As a chemist, you can expect to earn a median wage of $76,280 per year, or $36.67 per hour, according to the BLS. Additionally, you can learn more about science careers or search for chemist jobs on Monster. Hardworking, entry-level chemist offering a year of lab-testing experience within the FDA- and cGMP-regulated environment of health and beauty products manufacturing. In-depth knowledge of wet chemistry and titration methods; experience using instrumentation such as AA, FTIR, HPLC, GC and ICP. Technically proficient – advanced user of Mathematica, Spartan'10 and GAMESS. Research: Received National Science Foundation (NSF) research grant. Studied methods for using palladium to catalyze the synthesis of carbon-carbon molecules for pharmaceutical applications. Retained for yearlong contract to assist R&D chemists with analytical testing projects. Analyzed shipment samples, as well as raw, in-process and finished products. Operated and maintained analytical instrumentation and prepared lab reports summarizing findings. Adhered to FDA mandates, cGMP guidelines and internal quality-control policies. Gained experience using wet chemistry methods including titrations and pH, color and moisture testing. Played a key role in new product development by adjusting formulas and preparing blend sheets for review and approval by R&D department. Contributed to significant changes to seven global products by recommending new ingredients and techniques to R&D team; kept current with advances in the health and beauty industry. Tested rush samples for DEF Company, a Fortune 500 consumer-goods manufacturer. Submitted test results on time, with efforts cited as instrumental in retaining client business. Served on R&D team that evaluated and provided ingredient formulation adjustment recommendations for Action Lotion, one of client company’s fastest-selling skin-care products. Investigated and offered viable solutions for problem batches, leveraging analytical strengths to isolate issues and facilitate their timely resolution.